7 children were abducted on 3 different days in the Qeitun and Salaymeh neighbourhoods of al Khalil (Hebron) so far in December. ISM activists were present on these 3 occasions and this report contains video footage from all 3 incidents. Location: Qeitun / Salaymeh neighbourhoods. The town roads running south form the checkpoints are in a narrow part of the valley with one block (about 200m) between them. So the area is very small with steep hills ascending on either side. There were two incidents on the 4th December, on the parallel streets leading from the checkpoints of Salaymeh (checkpoint 160) and Qeitun (Abu Rish). 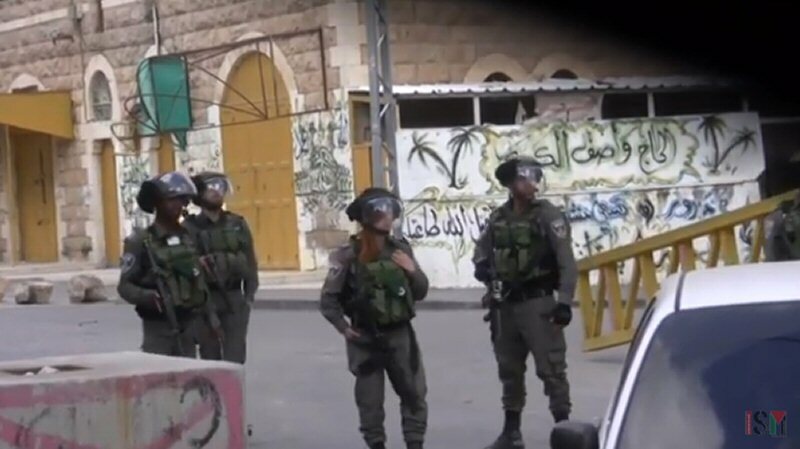 Soldiers had entered the neighbourhood through Salaymeh checkpoint. One group stayed on the street and the other entered behind houses into back gardens from where they moved close to the school. A small group of boys gathered by the school driveway after school. International activists were present and observing the situation from within 5 metres. No stones were thrown by any of the boys. The soldiers on the street maintained the children’s attention while the other group entered the back of a garage between the school driveway and a neighbouring house. The soldiers ran from the garage where they are hiding and ambushed the boys who were standing about 3 metres away. Activists intervened challenging the soldiers about their actions and asking what the boys had done. 1 child managed to escape. but two were abducted and taken to Salayme checkpoint. Concurrent to the abduction at Salaymeh, Israel Border police entered the Qeitun neighbourhood. They established up a “checkpoint” approximately 200 metres outside the “Alhajryt” Boys School checking IDs and body searching a Palestinian against the fence. They then moved back towards Salaymeh before pushing down the street to capture someone. The only boy in the vicinity was standing outside the Alhajryt School with one of his teachers. Again activists were close by when the ambush occurred. The child did nothing to justify his abduction. The boy’s teacher refused to leave him and they were escorted together to the Qeitun checkpoint. Border Police entered the area outside Quetun checkpoint, clearing the area of traffic. Two of them took position at the intersection closest to the checkpoint. Once again this seemed to be to hold the children attention. Another group of Border Police ambushed a group of children form behind in coordination with the first group who ran down the street. The second group seems to have set their ambush by entering through buildings from above the street. The boys were taken to the Qeitun checkpoint. Border police entered the Qeitun neighbourhood through a gate next to al Faihaa School and opposite the “bus checkpoint” by the Ibrahimi Mosque. They proceeded through the olive trees to a factory building in the centre of the block and hid there for more than 30 minutes until the school children finished school. After an unsuccessful attempt at emerging onto the street without being spotted near to Qeitun checkpoint they came out onto the cross street between Salaymeh and Qeitun. They tried an initial sprint to the intersection but there were no children there. They then wandered aimlessly around but were unable to provoke anyone to throw stones at them. A man was randomly stopped, taken from his car, ID checked and body searched. They then returned to the intersection with road from Qeitun checkpoint and managed to provoke a few small stones to be thrown. The commander then ordered two of the soldiers to sprint down the road in another attempt to capture someone. The only boy they could find was a 10 year old standing outside a shop holding the hand of his 4 year old brother. They were surrounded by adults. Activists were on the street on both sides of the shop and witnessed no stones being thrown. Activists tried to intervene and repeatedly asked for a reason for the boy’s abduction but were ignored as the boy was forcefully taken. He can be heard calling, “Achi! Achi! [My brother. My brother!] as he is taken away. Leaving his younger brother without a family member. The Border Police escorted the boy to he police station by the Ibrahimi Mosque via the same route they entered the neighbourhood through the gardens olive groves. The Israeli Border Police and the Israeli occupation soldiers all acted with the intent of abducting Palestinian school children. Once they had succeeded they left the area immediately showing that this was their objective from the beginning. The presence and behaviour of the soldiers and Border Police was provocative and invited an excuse for abduction. None of the children abducted on these days was throwing stones. Nor was there any significant unrest or stone-throwing on any of these 3 days. International activists were close at hand on each occasion abductions occurred. One boy was 14 but the rest were younger. The children were never accompanied by a parent of family member and no attempt was made to locate one. The abduction of innocent children especially in these circumstances is violations of natural justice, humanitarian and international law. If the intent of these abductions was intended to be one of deterrence then it can only be construed as a form of collective punishment or psychological intimidation in order to subdue any form of resistance to Israeli occupation. If this was a civil matter the Palestinian authorities would work with the children as in any other country deal with such issues. The root of the problem is the occupation itself. The systematic oppression of the Palestinian people whom the children are part of is the problem that needs to be addressed. The abductions yet are another aspect of this systematic oppression that perpetuates itself as long as the occupation continues. The injustices of these arbitrary abductions only reinforces the resolve of Palestinians to resist the occupation and fuels reactions from the Palestinian youth who endure such things.